Probably a long shot, but before I have new mounting hardware (brackets) made for the new pick-guard for my ‘53 Electro II I thought I’d check with you guys first...on the outside chance that someone has what I need laying around in a parts drawer. If anyone has these parts and are willing to part with them I’d love to hear from you. Is the bracket the standard 50's style? I'm pretty sure the bracket is standard. Looks that way, anyway. Just a flat strap with 2 bends. Do you also need an upper bracket? Those are hard to find but turn up occasionally. I'll keep an eye out. Hey Fred...yep, I believe it’s the standard 50s style bracket. If you have one that would be great. Yep, I need the upper bracket too. Thanks! There's more than 1 bracket? 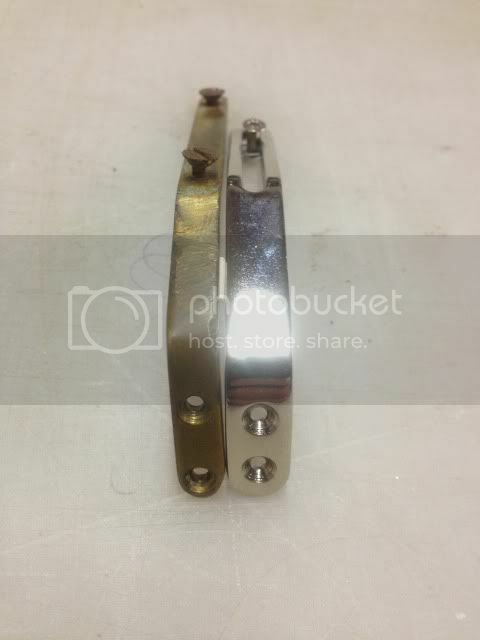 Before '55 Gretsch had the upper pickguard screw/nut go into a bracket that was screwed into the fingerboard extension. Should be easy enough to check the guitar for one hole or two at the waist. I’ve got a really corroded one. Chris, you say “really corroded” but is it structurally sound, with just surface corrosion? Would it clean up do you think? Or would it dissolve if I attempted to plate it?